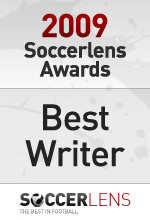 The Soccerlens Awards recognise the best websites and the best writers in football.. After the great success of the 2007 and 2008 editions, SL readers and editors gathered again to choose among 17 different awards categories and crown the best out of over sixty quality football sites and writers. Yes people, YOU voted (over 9,000 times) for your favorites in football. 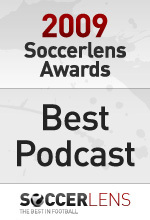 The Soccerlens Awards provides you, the public, with the opportunity to give props to those who have kept you informed, amused, and entertained for the past year. The writers who have made you laugh, those who have made you cry, and all those kickass blogs of footy goodness that no matter how hard your boss screams, you just can’t keep away from at work. Just like last year, there are two winners for each category in the SL Awards: a Readers’ Choice (voted by you) and an Editors’ Choice. Both choices bear equal weight. It’s just that we felt that to balance out the votes from some of the more popular sites, we needed editorial picks to reward quality as well. Sometimes the Readers and Editors selected different winners, and we’ll leave it for you to decide who made the better choice. 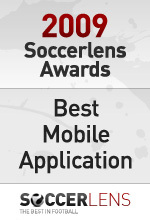 And so, after two weeks of intense voting and behind-the-scenes deliberations we’ve selected the winners of the 2009 Soccerlens Awards. What we have here is a solid collection of some of the best of football in the blogosphere. Organzing this ceremony sure was no easy feat, but we definitely hope you like the final product. For us, it was well worth the effort. Celebrating the best (not the one with the most friends or the one supporting the biggest team) football writer. The award has stepped up a notch this year since we’ve combined the ‘blogger’ and ‘mainstream media football writer’ categories here, meaning that the best of the blogosphere go toe to toe with the best of print and online media. There was vocal support for Ives in last year’s awards and it shone through this time, with readers voting him in as their favourite football writer. Soccer by Ives has a significant online presence in the US and worldwide, and Ives does a stellar job giving football fans the world over their daily fix. The Joy of Six series is hands down the best football column around, and Rob has been a key part of making it so good. What it says on the tin – the best online ’show’ in football – radio or video. There has been a rise in the number of podcasts started in 09, so the competition was fiercer this time around. Readers’ Choice: The Football Ramble. Top for quality, top for freshness, top for its wide coverage of football, top for the banter and top for having a fun cast to listen to. Runner Up: Football Weekly (Guardian). Editors’ Choice: The Football Ramble. The Football Ramble is what every football podcast tries and fails to be. Kudos. Runner Up: Two Footed Tackle. With the advent of social networks, we’ve merged the forum and community awards of last year to create a single award for the best ‘community’ of football fans. Social networks vs forums vs blogs – who has the best (or most) fans? Kickette has set the standard in what an online community should be like – loyal, passionate and incredibly dedicated to site. Runner Up: The Offside and Big Soccer (tied). Several sites have more users and more traffic, but none of them put as much investment into community as Kickette does, and it shows throughout. Your #1 source for football news. Everyone has their own favourite, but which site is #1 for the most fans? Goal has significantly invested in improving their news coverage in 2009 – at a time when other major organisations were cutting back. They have an excellent crew of writers and while they will report just about anything – they are definitely the most popular football news site. If you’re looking for quality English football news, you can’t go wrong with the BBC. There’s no bias so the analysis can be dry but in terms of plain ol’ footy news, the Beeb gets it right. The best team / club site. The biggest names and brands. Readers’ Choice: Republik of Mancunia. ROM proved to be the most popular team site this year – there may be other sites with as much following but ROM edges it for it’s consistent improvements in 2009 and month-on-month growth as the #1 destination for United fans. Runner Up: This is Anfield. Editors’ Choice: Republik of Mancunia. Showcasing the best league / competition / region specific coverage. Be it the Premier League, US football, South American football or the World Cup, which site is the best in giving you the latest news, insight and everything else you want from it? EPL Talk edges out mainstream media sites like the BBC and the Guardian by giving you proper football analysis and wide-lens coverage of the English Premier League. Runner Up: World Cup Blog. Over the years, EPL Talk has become a football blogging icon – coupled with the podcast, it’s quite possibly one of the best football blogs around. The best team-specific blogger / writer. This is primarily for unofficial fan sites – we’ve yet to see a great team-specific ‘official’ writer or MSM correspondent. Readers’ Choice: Scott (Republik of Mancunia). Like we said above, Scott stands head and shoulders above the competition when it comes to creating an online movement in football. Editors’ Choice: Scott (Republik of Mancunia). Runner Up: Adam Bader (Real Madrid Talk). A special mention for Adam – there were a couple of very good bloggers who could have made this spot, but Adam edges out because of how he has established himself and his brand online using all the social media tools available to a blogger. The best pundit on a specific league, competition or region. Think Tim Vickery (South America), Sid Lowe (La Liga / Spanish Football) or … if Soccerlens writers were eligible … James Horncastle (Serie A). Open to all writers. The walking talking football tactics bible. Possesses a rare ability to view a game as a grandmaster might view a chess board. Runner Up: Raphael Honigstein (Guardian). The top source for football gossip – from the usual transfer rumours to your more colourful gossip about the teams, the players and their lives outside football. Dirty Tackle recently made the move to Yahoo! and it’s well-deserved – DT is a source of fun and entertaining gossip 7 days a week. COS may get a bad rep for their style of reporting but when it comes to rumours and gossip, they do a great job of bagging and tagging all of them. Or in other words, the football site that makes you laugh the most. It could be a comic, it could be satire, it could be banter, or it could be sheer stupidity. Take your pick. The guys at Football Ramble have made a big splash in the blogosphere and it shows in the readers’ support for them – and yes, they’re funny too. A few columnists get football humour right, but as THE football comic strip, there can be only one winner. The cream of the crop from mobile football applications and mobile football games. Readers’ Choice: Championship Manager 2010. I point you to this comic. A FOOTBALL game on the iPhone – it sounds unreal until you actually play it – and then you can’t stop playing it. A smashing effort. Strictly and exclusively ONLINE football games. Video-games are off the list this year (seriously, FIFA or Football Manager, it’s apples and oranges) and mobile games have their own category. Video-games with an online multiplayer option (e.g. FIFA, PES) are not eligible for this category, although online versions of popular video-games (FM Live) are eligible. In addition, fantasy football games and football prediction games are part of this category (because, you know, they’re played online). Just like FIFA 10 on the iPhone, Stick Football has created a simple yet addictive playing experience. Runner Up: Premier League Fantasy Football. A massive, massive football management game, you can’t beat it, although FM Live, OFM and Fantasy Football come close. Who gives you the biggest and best centerfolds for the women of football? Well, not strictly ‘of football’, but they make following the game so much better. The site that brings you in-depth analysis and fan opinion from football teams around the world also brings you the best looking wives and girlfriends of footballers from around the world. The pioneer of Football Babes galleries and despite the valiant efforts of other websites, they’re still the best. Betting odds, betting tips, maximization of earnings, etc. The terror of the housewife and paradise of the modern football gambler. A bucket load of tips, odds and news for punters new and old. Runner Up: The Daily Punt. Bet365 may have the best incentives, Sporting Index the most intellectually stimulating and Paddy Power may have the most entertaining bets, but overall Betfair is perhaps the best all-round betting destination for football fans – and given the competition in that niche, that’s saying a lot. More and more football fans are doing their footy shopping – kits, boots, gloves, balls – online. Which retailer is the best? Which site gives you the best product reviews? We look at both review sites and proper online stores here (i.e. both SoccerPro and FootyBoots count). 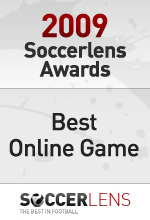 With a name like Soccer.com, you can’t go too wrong can you? Editors’ Choice: Pro Direct Soccer. A proper football store, comprehensive, carries any and every football product you might want, and the user experience is great too. The top resource for football video clips – goals, highlights, etc. No, no YouTube. A football video community where football fans can share videos and other blogs can setup their own football video channels. It helps push FT into a league of it’s own for football video sites and we expect great things from the guys at FT in the future. Runner Up: 101 Great Goals. Editors’ Choice: 101 Great Goals. Still the kings of football goals and videos. Who do you go to for football stats? For live scores? For the hard numbers after the game? IMScouting has become a popular destination for football fans looking to glean information on their club’s potential transfer targets. IMScouting is the first system of its kind to try & provide a full catalogue of football players in leagues from all over the world. As player stats go, this is the only site you need to bookmark. Major props to Nicolas Pin for his impressive design work on the award graphics. Also see: Football bloggers pick the best websites of 2009. Ahmed, have you left out the best kit award and fantasy game award? I mean you could have taken some referance from the 2008 edition. By the way, since SL is newly done up, will there be a forum like it used to be? @Hamburg left out the best kit award – I thought we might do something like that as a poll in the forum or just on the Shirts blog. Fantasy games are now rolled up with online games in the best online game award. Forum – will put up an update on this soon. rofl @ world or warcraft and pornhub.. how about a new category for the weirdest (read: funniest) suggestions? I think you intentionally left out a lot of Arsenal related stuff. I’ll bet my arse on it that there’s gonna be more Arsenal sites actually competing for all those categories. Hey Ahmed, how come The Spoiler got the WAGS award? They haven’t done anything WAG related since July 2009! Still the best galleries outside SL mate. 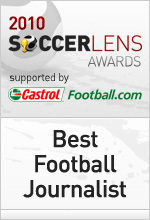 where is the best live football site award? and best shirt award? No disrespect, but as a male consumer of football on the internet, I am not going to be part of a football community that has a pink background.